Remember when the mere mention of classroom AV conjured up a vision of an AV presentation? Luckily, AV in higher education isn’t what it used to be. 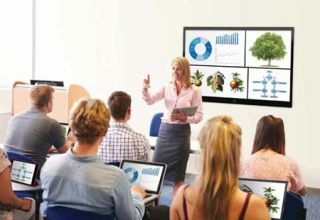 When configuring a classroom today, one has to marry hardware elements, such as signal distribution, with software-based services, such as capture, content sharing, and workflow among other collaborative aspects, he noted. These important trends, such as learning initiatives like the flipped classroom, collaborative teams, and blended classrooms dramatically increase the amount of interactivity and flexibility. The traditional approaches to fixed-AV rooms just don’t apply. Now, wireless control and streaming can happen from the device that’s already in the pocket of the lecturer, and students can participate by sharing media to any number of displays that are deployed to support their team, study group, or presentation. Of course, a wireless front end can support flexible student spaces while still being plugged into a more traditional back-end system. “Lecture-capture systems, in-room control panels, and video distribution for distance learning can be integrated into a more flexible classroom install,” Jaynes said. “For example, a wireless-enabled TEAL environment can be routed to overflow rooms, or even off-campus through software-based video distribution systems. As classrooms provide that infrastructure and access to the digital content highway, the next important aspect is ensuring that highway is easy to use and navigate, and not just for teachers, McGarrigle said. “With flipped classrooms and interactive teaching modes, students are leading presentations and sharing their work via these same classroom AV technologies. Having the means to moderate classroom sessions by control and management, not only of the devices in the room but the flow and dissemination of content, is a key need. This necessitates the need for a smart control system approach for this digital content to be controlled and the classroom session to be orchestrated.